It seemed appropriate that I should take part in a debate about natural capital and wetlands yesterday, on International Biodiversity Day. I was invited (I think) to be the Natural Capital dissident. It was a good debate and I enjoyed discussing the issues with my old boss Martin Spray from Wildfowl and Wetlands Trust, and Charlie Stratford from CEH. I understand a podcast of the debate will be made available in future and I’ll let you know when it is. This is based on an article I wrote for Lush Times yesterday to coincide with the debate – actually this is based on the speech I wrote, though of course I completely deviated from it! I have to say I think biodiversity is an ugly word. I much prefer Nature, or Wildlife. Biodiversity is clunky, and not easily understandable. It has its place – in technical discussions – but if you’re going to try and persuade people in different countries, with different cultures, that Nature is important (which I think is what these International Days are about) then it’s not the right word to use. But then biodiversity, as a word, is relatively harmless compared with the term ‘Natural Capital’. Natural Capital is a relatively new (from about 1988) economic idea. The old notions of Capital referred to things like Land, resources like Coal, and Labour. Over the years, Capital was broadened to include Social Capital and eventually Natural Capital. Natural Capital is now described as the sum of all the things nature provides to people – which are also termed Ecosystem Services. Now there is growing movement to push for Natural Capital to be given a financial value, so that it can be properly accounted for in the economy. Language is always important when working to achieve understanding and then change. And I am always interested to explore where the words we use come from. Capital derives from the Latin Caput or head. Originally this referred to head of cattle, which was (and still is in some places) the measure of someone’s wealth. This is also where the word chattel as in ‘Goods and Chattels’, comes from. Naturally, Stock derives from livestock, and the Stock Market was the place to trade your Cattle, long before anyone had the idea of companies or shares. Less obviously a Fee comes from the Saxon Feoh, which means Livestock or Cattle. And in a similar vein, Derivative comes from De rivo, literally water drawn from a stream. The language of capital, and of economics is full of the ghosts of a much closer relationship with, and conscious dependence on, Nature. But these words have been appropriated, altered and yoked to serve other needs. Natural Capitalism seeks to place a value on Nature, for our own benefit. But are there other values outside the human ones We don’t know whether an Elephant knowingly values an Acacia tree, but it certainly depends on it, whether it knows or not. And the same applies to every other animal, plant, fungi or bacteria that makes up every ecosystem on the Planet. The ideas of Natural Capital, that value flows from nature to people, is based on the human notion of property rights – if you own a piece of land, or a tree (or an elephant) you have the right to do what you want with it. But does nothing else in Nature have property rights? Who decided that? Even more bizarrely, property rights are conferred on entirely artificial constructions, like companies, or public institutions. Again this ignores everything else. How do we assign value to the ecosystem services a tree provides an elephant? Elephants have no need of money but that is irrelevant to what the tree provides the elephant. If all species can assign values to the things they need for life, then most of the value in an ecosystem lies in the relationships between the species that comprise it – the value is internal, not external. This could be called intrinsic value. Natural Capital economists do not like the notion of intrinsic value, because it messes up their equations. Professor Dieter Helm, the leading Natural Capital economist and chair of the UK Natural Capital Committee, described intrinsic value as “dangerous” because it “opens up the possibility that the world might be better off without us.” This sounds a bit hysterical to me. One recent example shows up the dangers of using this trade-off approach all too well. Economists use a Cost Benefit Analysis (COBA) to look at the environmental impact of an activity, usually development. The costs (financial) of developing a road or a new housing development or whatever are balanced against the economic benefits – so, in order to do this financial figures have to be calculated for the benefits the environment provides (us.) During the Obama administration, an assessment of the value of US wetlands was made, which concluded they provided $450M a year of benefits to the US economy. On this basis Obama created a Waters of the United States (WOTUS) programme to support these wetlands. But when Trump took over, his “environment” man Scott Pruitt ordered are-evaluation and found them to be worth only $50M, far less than the costs to the economy of protecting them, calculated as $300M a year. At the press of a button, those wetlands suddenly had no (net) economic value. The Natural Capital Coalition argued that what Trump had done was terrible – and of course he is the most anti-environmental world leader, the world has ever seen. But all he was doing was showing how the COBA approach loved by the Natural Capitalists is so wrong. Put a financial value on nature, and you put it in peril. Now Trump is also attacking the legal basis for protecting nature in the States, but it will be a much tougher route, through the courts, and up against people using ethical arguments for why it needs protecting. Evidence from the field of psychology suggests that when people think about the financial value of Nature, these thoughts “crowd out” any ethical or moral concerns for Nature. In other words, you may feel a moral duty to look after a tree, but if someone offers to pay you to do it, you then forget about that moral duty. And if they stop paying, you are more likely to cut it down. Natural Capitalism tells us that the current economic system values natural capital at zero, and therefore ignores it. So, if natural capital is suddenly given a value (where previously it had none), then new economic value will be created. We could call it a magic money tree. The Office for National Statistics tells us that UK natural capital has a value of £750Bn. This may sound like a lot, but London’s residential property is worth twice that. One of the reasons why London is worth so much is because of Quantitative Easing: The last time the Magic Money Tree was harvested, £435Bn was created out of nothing – and that capital flowed into many places, not least property – here and elsewhere. How much of it flowed offshore, outside jurisdictions, away from tax payments for public good? Nobody knows. The National Crime Agency estimates that nearly £100Bn a year of stolen money is laundered through the UK (and into UK offshore territories), much of it from Russia. Capital is always flowing to places where it can’ pool’, away from the grasping claws of Regulators and Taxmen. Land in the UK is a good example of this. Farmland (75% of the UK) has become a massive tax shelter. It’s a tax haven, hiding in plain sight. Tens of billions of pounds a year are lost to the Exchequer via this tax haven. Are all those tax reliefs providing any benefit – is Nature, let alone Natural Capital, benefitting from them? If the value of the UK’s natural capital really was converted into financial capital i.e. real money – where would it flow? One thing we can be sure about – it will not flow back to the “providers” of the “services” i.e. nature itself. It becomes just another asset to be traded, and, like QE, it will contribute to asset price inflation. Ecosystem Services is another appropriation, another euphemism for something quite different. The modern word is used to describe a transaction. A plumber provides a service by fixing your boiler, for which they receive payment. But Ecosystem Services harks back to the original meaning of service – from the latin servitium “the condition of a slave.” And that is really much more accurate, because we have effectively enslaved large parts of the planetary ecosystem, to serve at our will. Does the concept of natural capital recognise this injustice? Does it work to emancipate the enslavement of Nature? Slaves had value after all, and the market determined that value – even though that value never flowed to the slaves. The market had no interest in emancipating slaves, indeed some economic historians recognise the central role that slave-driven production had in kick-starting the industrial revolution and creating the wealth of the British and other Empires. It was political campaigning, driven by moral arguments, plus a few slave revolts, which led to Emancipation. Ironically when Emancipation came, it was the slave owners who were compensated for their loss, not the slaves, who continued to live in penury. Similar campaigns exist today (mainly outside Europe) seeking to give Nature “legal standing”. Natural Capital is supposed to be the way to address market failure, which describes when the market doesn’t price in the value of Nature to economic transactions. But there are tried-and-tested ways to address market failure: Regulation, Taxation, Subsidies (payments to create public benefits) and Education to reinforce the moral arguments for Nature. None of these approaches have been entirely successful, but they have all been used with some success and without needing to try and place a financial value on Nature. There is a great danger, with the Natural Capital approach. It is that those who believe the market to be the only true solution to all problems (also known as Neoliberals) will seek to exploit the good intentions of others, and replace all the well-established remedies for market failure, with a market-based solution, turning Nature into just another commodity to be traded. We can look at some examples from the past which might help shape a new relationship between people and Nature, of which we are both part of and apart. Commons existed for 1,000 years in Britain. Commons restricted property rights of both owners and commoners, and in doing so required both to use the natural resources provided in a more sustainable manner than purely private property owners would do. Nature thrived on the Commons but the Enclosure Acts saw most of them privatised over a 300-year period. A belief in the sacredness of nature also helps people to work with Nature, rather than against it. Bali’s thousand year old water temples are a good example of this. 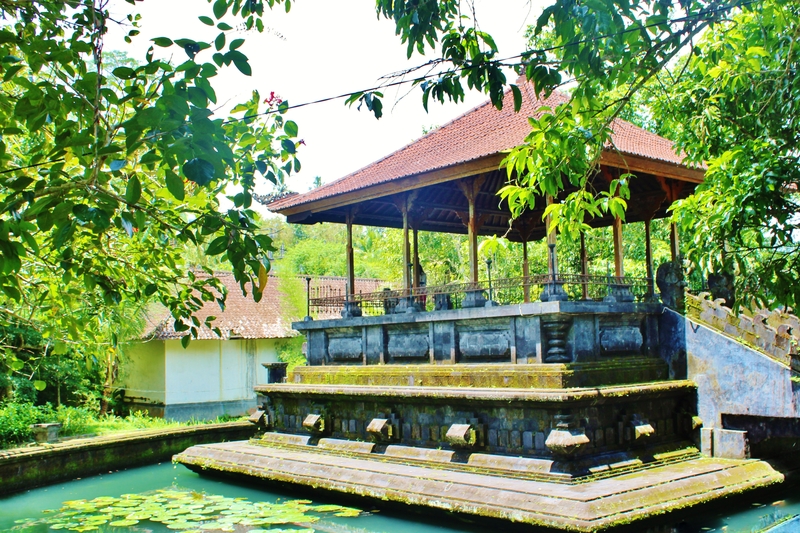 The Temples and Balinese rice farmers worked together to ensure harvests were sustainable, water was shared out equally and different communities planted their crops at different times, according to where water was available. Pests were controlled by a system where every community fallowed their land at the same time, starving pests of food. When new crops and agrochemicals were introduced, alongside Government rules which ignored the traditional approach, the system fell into chaos, pests proliferated and rice harvests plummeted. Thankfully the value of the ancient system was recognised before it was too late, and the Temple control reinstated. Rather than seeking to make more sacrifices to the God of the Financial Market, perhaps we need to find ways to create a new sense of the sacred in nature. This entry was posted in biodiversity, Lush Times, Natural Capital and tagged international biodiversity day, Lush Times, Natural Capital. Bookmark the permalink. Oh for more people to truly value the natural world (i.e. intrinsically). I observe so many people who use the reserve that I warden, who see it merely as a place to walk their dog, to smoke dope or consume their takeaway food. That would be all very well, but then they leave a mess, make a noise and regularly try to steel our tools. On the other hand they are reckoned to be benefiting from the fresh air, the improved serotonin levels from the being outside and the general calming influence of the bird song. For that we get a very modest payback from the tax system, for which we have to jump through various hoops. For example, in an effort to open up some patches of bare ground in our rather too lush grasslands we undertook some scraping of the soil surface, but then were mildly told off because we should have had a derugation on our agreement, our efforts being considered damage to the grassland, (which incidentally is not considered special enough for particular prescriptions anyway). So if our 18 hectare patch is to be considered as natural capital, how could its value be estimated? We more than spend the small sum from DEFRA on mending tracks, emptying dog bins and dealing with fly tipping. We also seek to enhance the nature on the site from activities including the soil scraping. We desperately need to improve our ponds. All this is only possible through volunteers. thanks Rob. I think the whole question of rights to exercise dogs wherever, whenever, will continue to vex land owners and managers. Dogs have rights, sure. But do they negate/over-ride nature’s rights? I don’t suppose the recreational value of nature for drug taking finds its way into any natura capital accounting system. But then, in the crazy world of Cost Benefit analysis, that would need to be set off against the environmental destruction caused by the drug’s production. Hi Rob. “I feel your pain.”! That would suggest, to me at least, that your nature reserve’s “ecosystem services” are undervalued by current EU Common Agricultural Policy (CAP) classic economics, so you’re getting paid well below break-even for their delivery. As CAP’s long been based on compensating you for the profit you have foregone by not managing it for intensive food-production (or biofuels, or timber) – you “waster” (!) – I guess that’s what one would expect unless it would make a good arable field; and certainly been my usual experience of nature reserve management, and management of land generally for nature, since it became a branch of agri-environment rather than something the former DoE Countryside & Wildlife Branch (Northern Ireland) or Nature Conservancy Council (Great Britain) gave you a grant for. Whether it would be better supported by a system that paid you for the “ecosystem services” you’re providing through the way you currently manage the land, or would like to if you could afford it; well, we shall see – possibly – in the early 2020s, if we can all afford to wait until then. Management of the sea for nature under a natural capital paradigm is a whole different kettle of fish though. The CFP doesn’t address it and, with a few local anomalies, exploitation and management of the sea is based mainly on individual and corporate rights to a common rather than actual freehold; albeit the UK Crown Estate “owns” most of the UK seabed out to 200 miles so benefits the exchequer economically by licensing some of those rights (e.g. oil, gas, aggregates); but not others (e.g. fisheries). I’ve not seen a model for natural capital approach to marine nature, but it would be interesting to. As for encouraging more people to value the natural world for its own sake, that’s a sort of evangelism I’d say; so maybe a study of the rise (and fall) of some of the world’s religions and philosophies and the failure of others to catch on beyond a few devotees would offer parallels. Hi Miles, thanks for an interesting blog and a well set out position. But for me 2 obvious issues come up – (1) how do you create a widespread belief in the sacredness of nature? ; and (2) how do you make decisions about protecting nature in the meantime, before that belief has taken hold? I don’t know the answer to the first, and I suspect we are a long way away from such a belief taking hold as widely as is needed. Natural capital is clearly an imperfect approach but I suspect it might the best chance we’ve got at the moment. And I don’t think it’s right to set it against subsidy, regulation and taxation – it could actually help inform all these policy instruments and promote their introduction. I offer up the idea of bringing the sacred back into our relationship with nature; how it should be done is beyond my reach, but believers from the major (and minor) religions of the world may wish to make some contributions. Is there a place for the sacred in the secular life of the rest? I would like to think so. We would need to define a new kind of sacred, perhaps. On your second point, I feel this just illustrates the seductive power of natural capital – it entices us to look at all other mechanisms for addressing market failure through its own frame, thereby corrupting them. Legal protections for nature, and the consequent restrictions on property rights (whether through legislation or regulation) existed long before the notion of natural capital accounting came along. Legislators used moral arguments to justify their introduction. The mitigation hierarchy, as applied through things like the Habitats and Birds Directives, recognised that economic arguments should not apply for our most threatened species and habitats; now this bulwark is being weakened, thanks to the natural capital approach. There is certainly a place for the sacred in secular life! My concern is more that a large proportion of people barely interact with nature and there is simply not enough interest in it at the moment. I agree means of protecting nature existed before natural capital came along, but I’m not sure they were that successful, and I’m not sure I’d want to rely on them to protect nature moving forward. Having said this, I’m concerned you think natural capital threatens existing protections as that is clearly a big problem. thanks Tom. One thing I can think I can be pretty confident about, is that we are not going to get that large proportion of disconnected people to care about nature, by arguing it has a financial value to them. I agree with you Miles about NC being a flawed approach. In English Nature during the late 90s we stopped using the term balance and started to seek integration instead. Much more appropriate as balance implies a trade off which inevitably diminishes what you are trying to protect. thanks Gwil. When I was doing some reading around the topic in advance of the debate, I was reminded of some work EN did on critical natural capital and constant natural assets. This I remember at the time thinking was really interesting – and the concept of NC was applied in a very different way from the Dieter Helm approach that we now see everywhere. I think it is possible that some of the thinking that underpins critical NC can be redeemed, but Natural Capital is now a phrase that’s synonymous with an accounting & commodification approach (and worse.) So we need some new language to use, as well as returning to those first principles you mention.